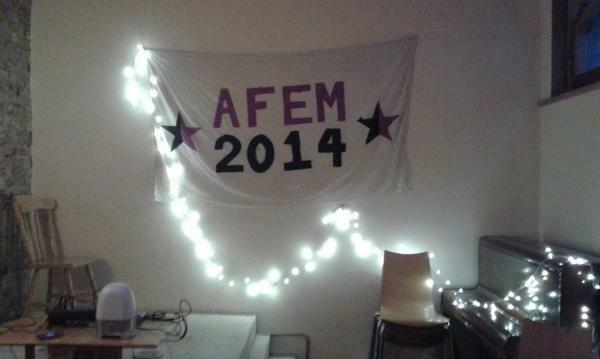 A look back at AFem2014, by a member of the organising group. “At a moment of backlash”, one organiser’s take on accessibility and accountability around AFem2014. A Storify of tweets from the day. More info will be added to this page as more and more people write up their experiences of the day, so watch this space. Set up for the day, briefing safer spaces volunteers. General meeting. This covered the background to the event, discussed the safer spaces agreement and what it means in practice, and gave space to ask questions about the safer spaces agreement. After this, participants discussed their hopes for the event, with the aim of structuring the 5pm feedback session. Anti-fascism: what one of the Berkshire Antifascists members contributed. Reproductive rights: Campaigning and direct action: write-up by @fleabite531. What is gender? a trans-led workshop: the whiteboard notes, a personal write-up of the transphobic hate at the end. The various strands reported back to the main group, and people discussed ideas and plans for the short-term future.